Even though I’ve had quite a few close encounters with things that crawl and slither, most of them don’t really creep me out. Anyway, I’ll start with spiders (and I don’t mean the lovable Spider Webb from my books). Over the years I’ve lifted spiders off my eyebrows, shaken them out of my hair, and, if statistics are to be believed, probably eaten close to a dozen in my sleep by now. Spiders don’t bother me. Before the advent of flea-and-tick collars, picking engorged ticks off the cats and dogs on the farm was a disgusting but necessary chore. It was too bad they didn’t make flea-and-tick collars for humans, too, because after being outdoors in Manitoba we almost always had to evict a couple from our clothes or bodies. Moving on to the crawlies: I’m not crazy about centipedes, mainly because I’ve heard they bite. But wooly-bear caterpillars are cute. As kids we loved to pick them up and watch them curl into a furry ball. Then after a few seconds they’d relax and crawl around our palms while we giggled at the tickly sensation. 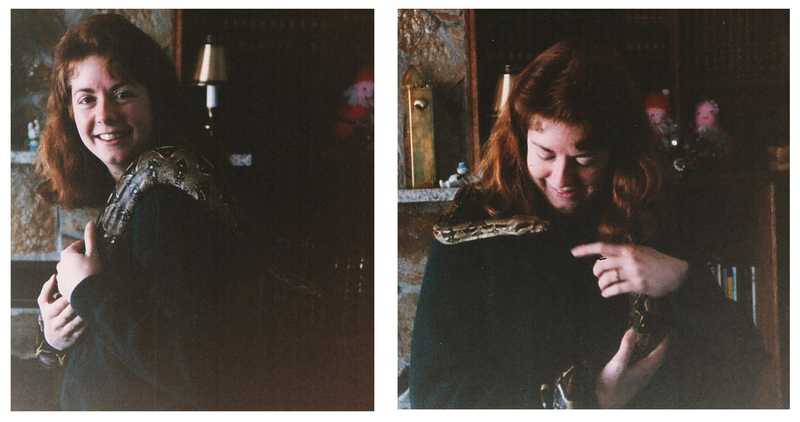 Years ago, friends had a six-foot long boa constrictor who loved to cuddle up and tuck his nose under my hair where it was nice and warm. Snakes are okay, but I do prefer a little advance warning. Sudden snakes are rarely a good thing, particularly if you’re poking around one of our desert micro-climates where the rattlesnakes hang out. Snakes in quantity are another thing entirely. The garter snake pits at Narcisse, Manitoba are amazing (click on the videos at the bottom of their page if you dare). I don’t know how they all manage to untangle themselves. Apparently the accepted collective nouns for snakes are ‘bed’, ‘pit’, ‘den’, ‘knot’, and ‘nest’, but I think a ‘macramé of snakes’ would be appropriate. Which creepy-crawly do you loathe the most? P.S. You may have noticed that my site was down for the better part of a day last week. My domain host crapped out completely (yes, I’m switching to a new one now) and all my emails vanished into cyberspace. If you emailed me any time within the past couple of weeks but didn’t get a reply, please resend your message. I promise I’m not ignoring you! Spiders are to me what rats were to Winston Smith. Best of friends, right…? No? Had a great experience with a friend’s boa…it would watch comedies on tv with us and laugh along with the sound track. Flying cockroaches are my down fall. Thank you for your posts. I look forward to them. Cockroaches fly?!? Oh, gross! I didn’t know that. As a general rule flying bugs don’t bother me, but now I’ll always wonder if the bug that just flew by me might have been a cockroach. And that’s so funny about the boa – who knew they had a sense of humour? Eating spiders. Well that is not a protein source I had considered. I don’t mind spiders, lizards and snakes although any that arrive in a surprising manner usually have me squealing. Also those that with a single touch, jab or bite that stop one’s heart from beating I am a bit turned off by. I hate all creepy crawly critters. For some reason I’ve never knowingly shared my path with a snake of any sort, thank goodness! Once I used a generic sunblock lotion and applied it generously over the exposed skin of my face, arms, and feet, as instructed and then went to paint on location (En plein air, for those with snooty art vocabulary). I got attacked by an army of ants who noticed that my sunblock contained yummy glycerin. Then there was the time I went to NYC to visit my hippy sister and her crazy lover. For some reason she wanted me to see the apartment that they didn’t dare sleep in because it had been burglarized too many times already, and they didn’t want to be there sleeping the next time it happened. She offered me to pick out some tea, and indicated that the tea was kept in the yellow cupboard. I opened it and screamed because the inside of the cabinet door was black, but rapidly retuning to yellow as the cockroaches fled. I flung myself back and landed against the kitchen sink, but that action motivated another mass exodus which I could see in my peripheral vision. Fully traumatized by now, I fled to the living room, no longer caring about the variety of tea I was about to drink. My sister soon brought me Jasmine tea, which by some bad juju I had only had one other time when I had the worst flu ever- the Hong Kong Flu. (Apologies to the fine people of Hong Kong, but I had no hand in naming that strain of flu.) I burned my mouth on the tea and set it down on the coffee table to cool a bit, and before I could drink any of it, one stalwart cockroach circumnavigated its way around the lip of the mug. Ugh! Eww! Gross! My sister explained that her lover was a vegetarian who didn’t believe in harming any living creature, so he refused to allow anyone to exterminate the cockroaches or even deter the pesky critters that harmed the plants at the organic greenhouse where he worked. The tour of the apartment only got worse and the steps my sister was taking to survive in the Big Apple appeared more and more bewildering and frightening to a naive teenager from the ‘burbs of Minnesota. Creepy-crawly thing was my name in school. Your topic of snakes reminds me of the old joke about the snake that didn’t have a pit to hiss in. I don’t mind any creepy crawly actually, Diane. Well, I say that, but I’m OK when I’ve gathered myself together after jumping out of my skin when they appear unannounced, as they do. During the jumping stage I’m a little less keen. I missed when you were off air, as I was out of Blogland at the time… I’m in/out quite a bit at the mo, but getting by somehow! Yes, it’s the suddenness that’s the issue, isn’t it? Hope things settle down in Blogland for you soon! Spider phobes? (over here as he raises hand). Snakes? I’m OK as long as they aren’t the surprise kind that you mention. What I really hate are the scorpions. Bad, very bad bugs, when they zap you you know what it was without even looking. I received an email the other day showing a rattlesnake den. Roiling I think the word is. They even struck at the camera. Scorpions are definitely the badasses of the bug world – I’ve never met one in person and that suits me just fine. But we humans still get the last laugh: scorpion pizza was a big seller at the Calgary Stampede two years ago. http://www.theloop.ca/scorpion-pizza-sells-out-at-calgary-stampede/. Bleah! A guy I used to work with had a terrarium in his office. We worked in a welding/machine shop. I was the manager, and he was the shop foreman. He kept his pets in the terrarium. Scorpions. And not just any scorpions, but those enormous black ones from the African deserts. He fed them mice. Live mice. He got a real kick out of watching them feed. I told him to seek professional help. Then I went out and found a better job. And this guy was the SANE one. Our boss, the owner, was a screaming maniac. I’m glad I don’t work there any longer. Yikes! If he was the sane one… just yikes. Good choice on the career change! I was thinking the exact same thing as Jono – I don’t mind non-poisonous spiders and snakes although I don’t want them ON me necessarily, and I don’t even kill earwigs any more (that’s new this year, when I found out they eat aphids), but if something wants to bite me, sting me, squeeze me to death or poison me, I’m not having it – I tell you, I won’t stand for it! Hah! But with my luck I would zap myself. Truth. Been there, done that. It leaves little grill-marks on your skin. Owie. Wondered what that would be like. Owie is right! FYI, years ago, a good friend of mine, a degreed entomologist and pest control company owner and operator, said that every fluid in any spider’s body was essentially a neurotoxin. That means, one way or another, there is no such thing as a non-poisonous spider. Cockroaches are disgusting and I don’t like biting ants or bald faced hornets, either. If it wants to hurt me I don’t like it. Everything else is allowed to live. Speaking of creeping and crawling, the “draft” line on the progress chart is creeping and crawling its way over to the other side. You tho rock, thithter! On a related note, when I entered my office today at work, I found that my desk and pretty much everything else was covered with sugar ants. Thanks a lump, Henders. This just CANNOT be a coincidence. A $5 can of Raid seems to have fixed the problem. Oh good. These welts are getting nasty. like you, spiders dont bother me unless they get to close to me, then I’m likely to drop a size 10 (uk) shoe on them and it tends to squish em. I hate moths, really detest them. I tend to get loads in summer no matter how hard I try to keep them out. I’ve never been a fan of snakes, but luckily we dont really have them in the UK so I dont run across any. Hi Karen! I’m glad your recovery is boring and uneventful – that’s the best kind! I’m such a bleeding heart, I pick up the spiders in a tissue and gently usher them out the door. Ants, however, I’ll heartlessly murder. They worry me – there are far too many of them, and they’re too organized! Here’s a handy tip. For post-op showers, think Press’n’Seal, the plastic wrap with the sticky stuff on it. You can wrap large areas of your bod with it and keep it all perfectly dry. Start below the affected area and wrap your way up above same. Press it all down well, and shower away. Of course, it will sound like you’re showering in a tin raincoat, but you’ll be perfectly dry under there when you peel it all off. Works every time. Been there, etc. Sorry about the creepy-crawly talk – hope you feel better soon! I’m not creeped out by most slithery-crawly critters – maybe leeches, yeah. During my recent stay at a cabin at the Tip of Long Point, Lake Erie, I found 3 lovely cucarachas in the kitchen cupboards, about 3/4″ long. No biggie. The Hawaiian varieties are about 2 1/2″ and you can hear them coming at you! That’s hilarious! (Well, probably not so much for the teacher.) I bet you were a hero to the rest of the class, though! P.S. I remember those pens – I could NEVER produce anything even remotely legible with them. I love my cheap Bic ballpoints!